Faith Wilding emigrated from Paraguay to the USA in 1961. She studied and worked with Judy Chicago and was part of the Feminist Art Program and Womanhouse in Los Angeles in the early 1970s. Till this day, she refuses to limit herself to a single artistic medium, and she continues to expand and develop the formal structures of her art. Her works are textile sculptures, performance, new media and critical discourses that explore social problems and issues. Faith Wilding is a faculty member, advisor and the Chair of the Performance Department of the School of the Art Institute in Chicago. A 15-minute monolog, scripted and performed by Faith Wilding in the Performance program at Womanhouse, "Waiting" condenses a woman's entire life into a monotonous, repetitive cycle of waiting for life to begin while she is serving and maintaining the lives of others. 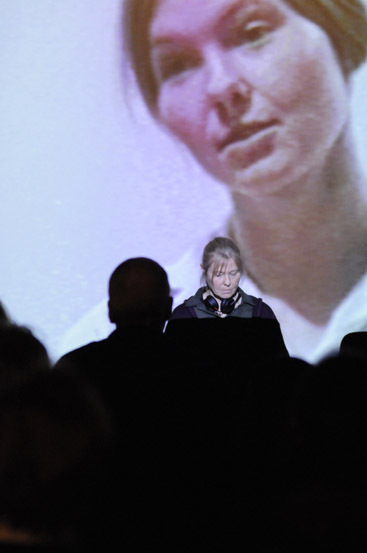 Faith Wilding re-enacted this iconographic performance from the 1970s in 2007. She performed it again for re.act.feminism on 23 January 2009. 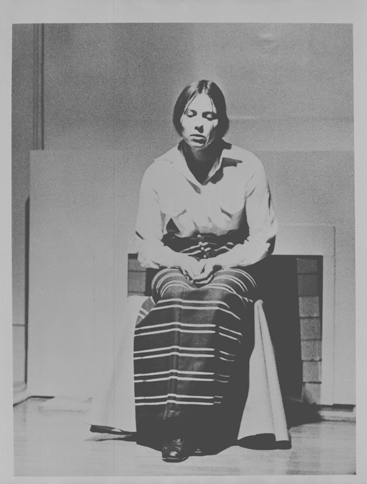 Faith Wilding’s performance Waiting is an icon of feminist performance art. Her photograph has been reproduced all over the world in countless publications, but the performance’s spoken text and video documentation are relatively little known. For re.act.feminism, Faith Wilding wrote a new text to accompany the documentary of the original performance. In the text, she describes waiting as an act of resistance, reflection and refusal.